You can make responses appear somewhere in your course or it can be captured by the ‘Your Data’ feature (if this is available on your account). Text input clips can be great for self reflection activities, to do this use the ‘Text input’ and ‘Inputted text’ clips. To add a ‘Text input clip’. Select a text field which you would like your Learner to type into (please note that you can not use Titles fields for this). …next give your Text input field an ID and make a note of your ID (your ID is what will be referenced in the Your Data and can also be used to display your text elsewhere in your course). For your ID it is recommended that you do not add spaces, breaks, capital letters, special characters or underscores. To display data from a ‘Text input clip’. If you wish to display the text that your learner types into your text clip in your course you can do so using the ‘Inputted text’ option. …add the ID of the Text input field that you wish to display text from, for example, I’m going to use the ID of ‘field1’ to display the text for the input clip I previously set up. 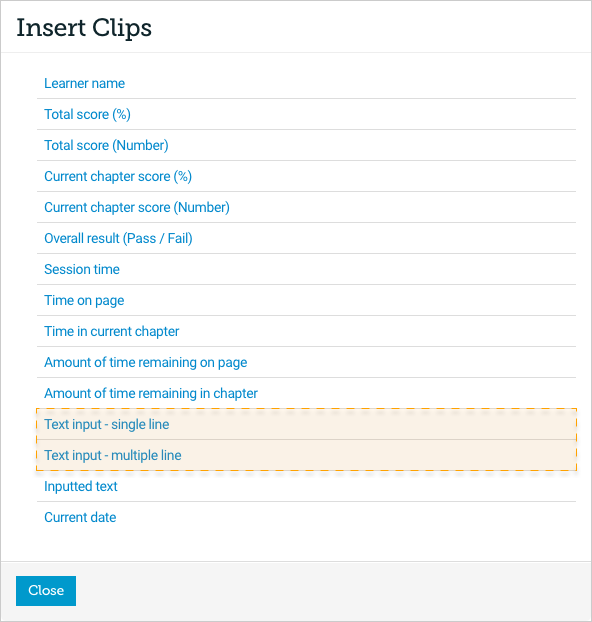 …it will then display on the page that I have set up the ‘Inputted text’ clip. Here’s an interactive example of learner input. Currently Text input clips do not report to LMSs, these fields are intended for self reflection or for use with the ‘Your Data’ feature. If you are using the ‘Backup’ SCORM release type, inputted text that will display in the ‘Inputted text’ field will not be saved between sessions.